A dinuclear centrosymmetric copper(II) complex has been prepared and characterized via FT-IR, UV-Visible and electron spin resonance spectroscopy, electrochemical method, and powder and single crystal XRD techniques. The two copper(II) ions are connected by two μ-1,1-O atoms belonging to para-fluorophenyl acetate ligands. Each copper(II) ion is coordinated by two other carboxylate ligands in monodentate and a 2,2ʹ-bipyridine molecule in bidentate manner. Thus the geometry around each penta-coordinated copper(II) ion is square pyramidal with distortion factor τ = 0.04. Purity and uniform crystalline nature of the complex was assessed from powder XRD spectrum. ESR signal consisted of partially resolved hyperfine splitting pattern while electrochemical studies revealed diffusion controlled electron transfer processes with diffusion co-efficient of 1.628×10–7 cm2 s–1. The results of all spectroscopic experiments support each other. The complex afforded mixed binding mode with DNA yielding DNA-binding constant values of 3.667×104and 1.438×104 M–1 using cyclic voltammetry and absorption spectroscopy, respectively. The preliminary studies heralded good structural and biological importance of the synthesized complex. 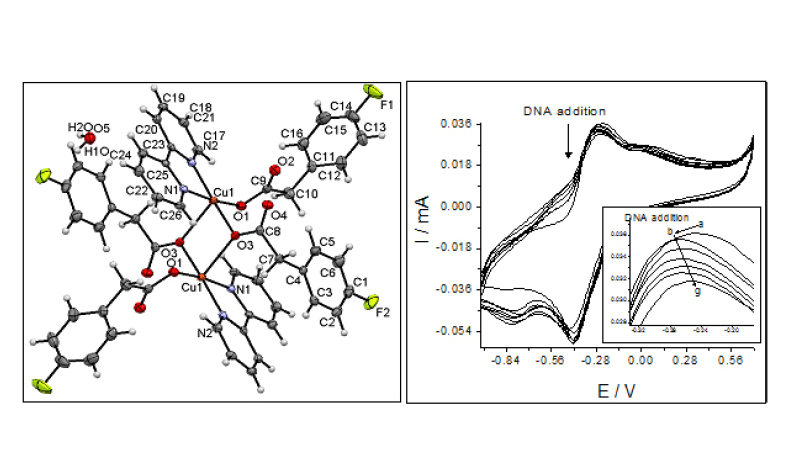 oxygen-bridged copper complex; structure; electrochemistry; DNA-binding study.